EU and Canadian trade officials continue to negotiate an investment protection chapter in the Comprehensive Economic and Trade Agreement (CETA) between the EU and Canada. Civil-society groups are demanding that this section be removed entirely as an affront to democracy, an attack on an independent judiciary, and a threat to climate change and our shared environment. Last May it emerged that a "fair and equitable treatment" clause had been inserted in a draft of the agreement that would outlaw any "breach of legitimate expectations of investors." The agreement has since been signed, though its details remain unpublished—negotiations have been in secret. "Fair and equitable treatment" is a catch-all term, and the definition used in the CETA was particularly broad. It is even protects what investors consider their "legitimate" expectations from "unpredictable policy change," so that a ban on a chemical found to be harmful to public health could be considered a violation of this provision. Investors will also be enabled to challenge scientific justifications of a policy and "arbitrary" or "unreasonable" relationships between a policy and its objective. These excessive corporate protections, built in to thousands of investment treaties and free-trade agreements, serve no social or economic purpose other than undermining our democratic rights to decide public policy and public-interest regulation. The EU commissioner for trade, Karel de Gucht, has admitted that a similar "investor rights" chapter is included in the projected Transatlantic Trade and Investment Partnership (TTIP) between the EU and the US. International experience with investor-state dispute settlement includes that of Canada, where recent court cases under the North American Free Trade Agreement (NAFTA) have challenged a moratorium on exploration for shale gas and two court decisions on the utility of a pharmaceutical patent. EU member-states are also feeling the sting of investor-state disputes. For example the Swedish energy company Vattenfall against Germany's decision to phase out nuclear power. In the US the use of such clauses in NAFTA has led to regulation-chilling cases, such as one £160 million case challenging a drilling moratorium in Québec. In the case of Tecmed v. Mexico a tribunal similarly ruled that Mexico had not acted "free from ambiguity and totally transparently" when a local government decided not to re-license a waste treatment plant because of environmental concerns. Campaigners say that in 74 per cent of the cases where American investors have won in investor-state disputes, tribunals found a violation of fair and equitable treatment, and a fear lurks that similar undisclosed passages in TTIP could be used to attack environmental regulations in European countries. The clauses would enable corporations to claim potentially unlimited damages in secret courts, or "arbitration panels," if their profits are adversely affected by environmental or consumer regulations. These investment cases are tried before business-friendly tribunals composed of corporate lawyers, and bypass national courts and override parliaments. Even expected future profits are subject to compensation. Health campaigners and consumer groups have raised concerns that the free-trade deal could weaken regulations on health, banking, data protection and food safety through the back door. Opposing investor-state dispute settlement is all the more important given the intention of the EU Commission to quickly conclude the TTIP with the US. The negotiating objectives for an agreement have little to do with free trade and everything to do with corporate power. TTIP risks being a partnership of those who seek to prevent and roll back democratically agreed safeguards in such areas as food and chemical safety, agriculture, and energy. What the negotiations really aim for is a massive weakening of standards and regulations intended to protect people and our environment. Such rules are branded "trade irritants," making them seem like an annoying itch for the corporations that have to adhere to them. These companies would like to see them removed, irrespective of the fact that the very reason for the creation of these rules is to protect people, consumers, and nature. 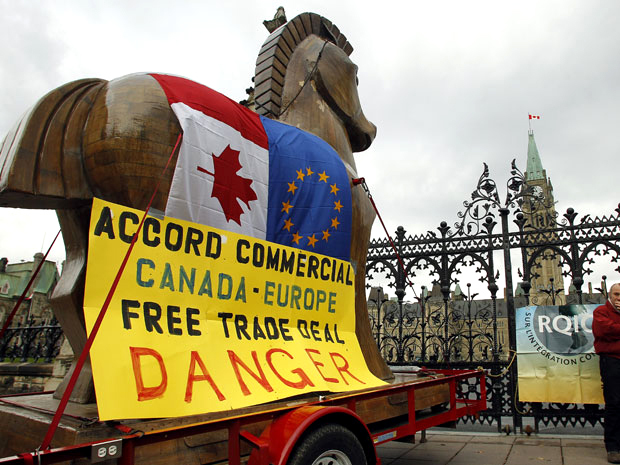 If the CETA is signed and ratified with Investor-state dispute settlement intact, democracy will suffer while corporations gain new tools for frustrating any number of policies designed to protect the environment, public health, public services and the conservation of resources and, crucially, to make our society more sustainable and equitable. People, not corporations, should determine the future of the economy and society.